The Norwalk Upholstering building in 1936. Norwalk Furniture has been a valued customer of Revolution Performance Fabrics since it’s launch in 2014. Norwalk is a highly reputable, innovative company that is rich in history. Norwalk started as an upholstery operation in 1902 and at that time, was called Galpen & Gerken. 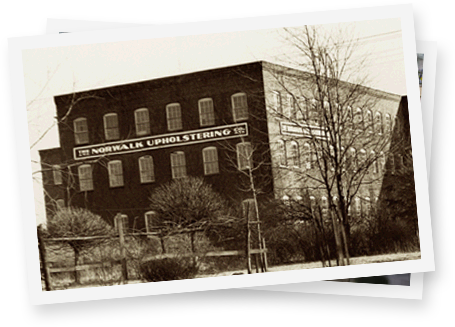 After some reorganization and a relocation to Norwalk, Ohio, the company incorporated and became Norwalk Upholstering Company in 1919. During the 1930’s, they halted furniture operations and contributed to the World War II effort by producing war materials such as jungle hammocks, foot locker boxes and grenade boxes. After the war ended, Norwalk re-immersed themselves in the furniture business and officially became Norwalk Furniture in 1965. Norwalk manufactured beautiful upholstered furniture and employed hundreds of people at their 225,000 square foot plant in Ohio. Like so many other furniture and fabric companies, 2008 hit the company hard. Determined to keep the company alive and a part of the local economy, twelve business people joined together and acquired Norwalk Furniture and are still the present owners. After surviving the recession, Norwalk hit the ground running! The company emerged with a new sense of energy, excitement and look. At the forefront of this new era of Norwalk was Caroline Hipple and Dixon Bartlett of HB2 Resources. Caroline and Dixon have an incredible eye for design and together, they make the ultimate design duo! Caroline’s long standing relationship with Norwalk took an official turn in 2016 when she became the company’s President. Caroline’s innate talent for design combined with her acute business sense, not only make her an excellent leader, but a role model for men and women in the furniture industry. Mike Willoughby teaching the Norwalk sales staff about Revolution! Caroline knew that performance fabrics were extremely important to the success of their furniture collections. Norwalk offers three different performance brands, one of which is Revolution. Revolution can be found on many Norwalk sofas, chairs, ottomans and even dog beds! Norwalk has a strong focus on educating their sales teams on all of their fabrics to ensure their customers are making the best choice for their home. Norwalk has truly withstood the test of time and the evolution of the furniture industry. We are proud to work with them and look forward to the many great things ahead! Below are two videos featuring Caroline Hipple in Norwalk’s High Point Showroom and their Las Vegas Showroom. Please take a moment to watch and learn more about Norwalk Furniture!